Marine reserves are not working - why hurry? Marine reserves are not working. Why hurry? By Dr Floor Anthoni, director of Seafriends Marine Conservation and Education Centre in Leigh. Marine reserves of New Zealand have hit the news recently since the public is being reminded that submissions on a review document for the Marine Reserves Act closes on February 19th. Just as an over-arching Oceans Policy is in the pipeline, the timing of this event can rightly be questioned, particularly since many of our marine reserves are not working - let me explain. Conservationists are quick to complain that less than 1% of our coastline is being protected, despite the 17 marine reserves now existing or under proposal. By comparison, some 30% of the land is protected. New Zealand prides itself of being a green and clean country, taking credit for our extensive national parks. However, most of our conservation estate is either too steep, too inaccessible or too cold for exploitation. They are our useless lands, having been preserved by accident. By comparison, our coasts are accessible and productive everywhere, and conserving these requires considerably more effort and foresight. But there is another important difference. Our national parks, resting above civilisation, are spared human influence, except for the damaging effects of introduced deer and other species. Sewage simply does not flow uphill to soil Mount Cook. But everything we do on the land, flows into the sea, the sump of civilisation. Here it kills marine life, reducing the biological diversity of our coasts while also affecting our inshore fisheries and marine farming. It has turned our pristine coasts into the equivalent of badlands. Recent biotoxin scares are but a small warning of what is happening down there. Whereas our national parks are the most pristine, and thus worth saving, we would not consider giving our eroding badlands of bare soil, gorse and foxglove similar status. Yet in the sea, this is precisely what we have been doing for 25 years. 12 out of 17 marine reserves are in serious decline. Do we really want to continue along this path? Do we really want to measure the success of marine conservation by the numbers of marine reserves and their visitors? Do we really want to risk the public's contempt and lose their support? Already since 1995 I have been fighting for improving marine reserves, but apparently to no avail. Why? Let me give an example. In the winter of 1998, a large mud storm (but not much larger than previous years') chased out 80% of the crayfish in New Zealand's first marine reserve at Goat Island. They were successively caught and never wandered back into the reserve. Two years later, scientists confirmed my observations, but the public is not supposed to know. Rather than learning from this fact, it is being hushed up. Why? Why are we presented with flawed information from scientists? Let me give another example. To prove that marine reserves are working, scientists measure the abundance of commercial species like snapper, blue cod and crayfish. They are paid by the Ministry of Fisheries or the Department of Conservation, hence their interest in only these three species. As can be expected, these fish increase in numbers as soon as fishing is discontinued - instant proof of the success of marine conservation. But these three species are rather mobile. They can easily move away from the mud clouds that cling to the shore and do their disastrous work. However, many of the thousands of other species making up the bulk of the coast's biological diversity, are not as fortunate. They are the real residents, often cemented to the rocks for life: the plants, sponges, seasquirts, anemones, corals and many more. Their health, presence or absence tells the real story of the health of their coastal environment. Yet scientists do not monitor these and have not done so for the past 25 years of marine conservation in NZ. Hence nobody knows that over 60% of our marine reserves are in serious decay. From year to year they are going from bad to worse. Why does nobody notice? It is fair to say that the vast majority, perhaps over 99% of the supporters and creators of marine reserve policy are armchair conservationists lacking hands-on experience from frequent diving over a long enough period to be able to notice changes. How many people would be able to 'read' the health of an environment from the animals and plants that have survived? Very few indeed. So the voices of those who know are drowned by those who don't want to hear, a recipe for bad policy and feel-good decisions. And then there are the myths and commercial interests. To publish the ecological disasters of our country would tarnish the 'green and clean' myth and to publish that a marine reserve like that in Milford Sound is under serious stress, would affect commercial operators there. So we won't talk about these things, and the public is left in the dark. Instead we are talking about replicates and systems of reserves and networks of these. Now we are keen to legislate 10% of our coastline into marine reserve before the year 2010, which requires 15 times the number of reserves we already have, or 20 every year. And who will be jailed when we fail to reach this ambitious goal? The legacy of a century of bad farming will still be with us for another century, so why hurry? Why do we want to put ambulances at the bottom of the cliff without attacking the real threats to our coasts at the top? Obviously, it is time to take a break and to think it over. 19 Mar 1995, article in Sunday Star: 'Marine reserves a failure' by Bob Drent. 25 Jan 2001, article in NZ Herald: 'Protecting a treasure from shoreline to sea' by Philip English. f211324m (horizontal): The coastal slip on left has deposited soil and rock into the sea. At each high tide, waves carve into it, releasing clouds of mud. These cling to the coast before dispersing, causing ecological damage in the process. New Zealand loses its soils 10-20 times faster than its environment can sustain. 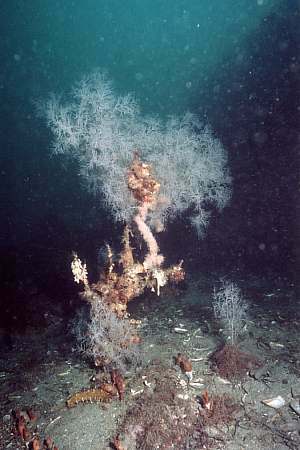 f027710m (vertical): The black ancorina sponge is a long-lived hardy species, growing attached to the rock. It is covered in dust, which will eventually suffocate the many water-filtering individuals it is made of, as it has done to the others, once occupying neighbouring rock space. Now the surrounding rock is bare or covered in short-lived algae, all smothered in mud. Dust can be seen suspended in the water. 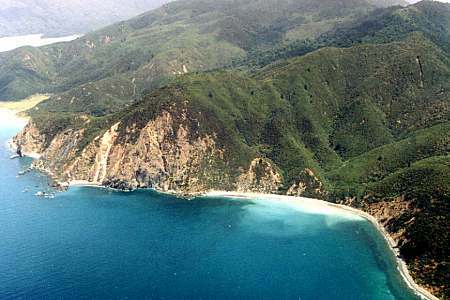 Ataata Point, Nelson marine reserve. f026711m (vertical or horizontal): These boulders are covered in dust and algae. Three old paua can be seen, but no young ones can be found. While surviving as old animals, young paua fail to establish or grow. The rocks are poorly grazed, all indications of a seriously stressed environment. Flea Bay marine reserve, Banks Peninsula. f027303m (vertical): Young black coral trees trying to survive where large old trees once stood. Black coral trees are sensitive to dust and mud, now all around in the water and clinging to every organism. Dale Point, Milford Sound marine reserve. 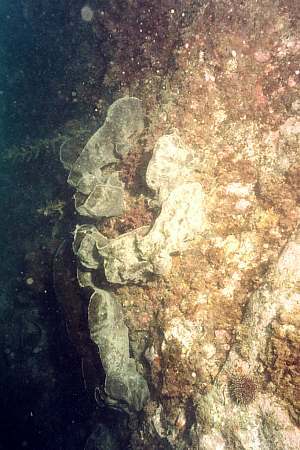 f027710m (vertical): The black ancorina sponge is a long-lived hardy species, growing attached to the rock. It is covered in dust, which will eventually suffocate the many water-filtering individuals it is made of, as it has done to the others, once occupying neighbouring rock space. Now the surrounding rock is bare or covered in short-lived algae, all smothered in mud. Dust can be seen suspended in the water. Ataata Point, Nelson marine reserve. f027303m (vertical): Young black coral trees trying to survive where large old trees once stood. Black coral trees are sensitive to dust and mud, now all around in the water and clinging to every organism. Dale Point, Milford Sound marine reserve. f026711m (vertical or horizontal): These boulders are covered in dust and algae. Three old paua (abalone) can be seen, but no young ones can be found. 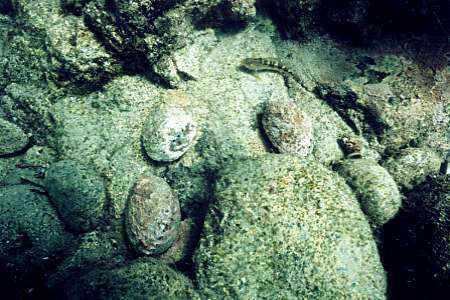 While surviving as old animals, young paua fail to establish or grow. Shells have blunt edges (not sharp), from poor growth. The rocks are poorly grazed, all indications of a seriously stressed environment. Flea Bay marine reserve, Banks Peninsula. f211324m (horizontal): The coastal slip on left has deposited soil and rock into the sea. At each high tide, waves carve into it, releasing clouds of mud. These cling to the coast before dispersing, causing ecological damage in the process. New Zealand loses its soils 10-20 times faster than the environment can sustain.